A man has been arrested after a serious assault outside a Coventry pub. Emergency services were called to The Unicorn Pub in Eastern Green on the evening of Sunday, December 9. A number of ambulances were sent to the scene after they were called to reports of a man unconscious in the car park. The man was treated at the scene, but taken on blue lights to the major trauma centre at Coventry's University Hospital. A 19-year-old man has now been arrested and remains in police custody after the disorder involving a large group of people just after 11pm. Police were still at the scene on Monday morning with a section of the car park taped off. Pub company says late night Coventry assault is "deeply upsetting"
A spokesman for the pub where a man was seriously injured has spoken out on the incident. They have said it has been a 'deeply upsetting' incident after disorder involving a large group of people left a man with serious head injuries. A spokesperson for The Unicorn said: “We are doing all we can to assist the police’s investigation into an incident that took place in our car park last night. "We have provided them with our CCTV footage and the pub was closed earlier while the investigation continued, but it has now reopened. 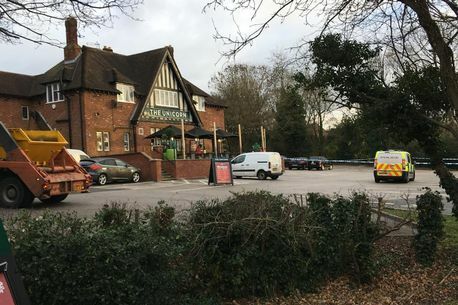 A man left with serious injuries after a large disorder outside a Coventry pub remains in a critical condition nearly three weeks on. The 26-year-old suffered a head injury during an incident in the car park of The Unicorn pub in Eastern Green on Sunday, December 9. Emergency services were called - including police and the ambulance service - at around 11pm and West Midlands Police has today confirmed that the victim remains in hospital where he is "critically ill". A 19-year-old man had been arrested in connection with the incident and released pending further investigation. CoventryLive can reveal that he has now been released with no further action to be taken. Another man, aged 21, has been voluntarily interviewed at Coventry police station as officers continue to investigate.